On the back of the hugely successful Wall tour, Roger Waters has introduced thousands of new people to his music, paving the way for another go around the world in support of his fantastic 2017 album Is this the Life We Really Want?. But solo or with the Floyd, throughout his entire career since the early 70’s, Roger’s imposing stage presence has been married to a black Fender Precision Bass. It is this instrument to which we now turn our focus. Or rather, these instruments, because according to Phil Taylor, guitar tech for both Roger and David Gilmour during the Pink Floyd days (and still employed in this capacity by David today), following the theft of all of the bands guitars in 1970, Roger owned three black Fender Precisions; One with a rosewood fretboard, two with maple. One of the maple basses seems to evade more mention, but the other two each play a large part in Roger’s recording career. Roger’s preferred bass from 1970 to around 1978/9 was a black Precision with a maple neck, large headstock logo, a white pickguard and chrome pickup cover. This bass can be seen on the tours in support of Dark Side of the Moon and Wish You Were Here, and particularly in some parts (notably the studio footage) of the Live in Pompeii film, where it shares the spotlight with a sunburst P-bass with a rosewood fretboard. 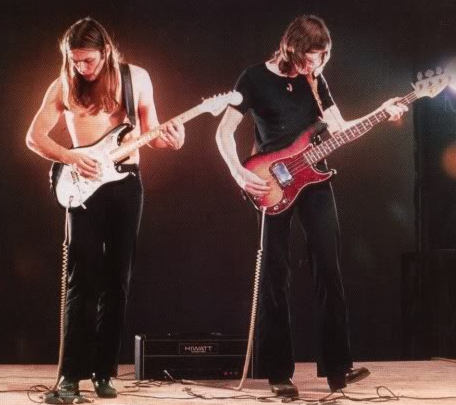 David Gilmour with black strat and Roger Waters with the sunburst ‘Pompeii’ bass. 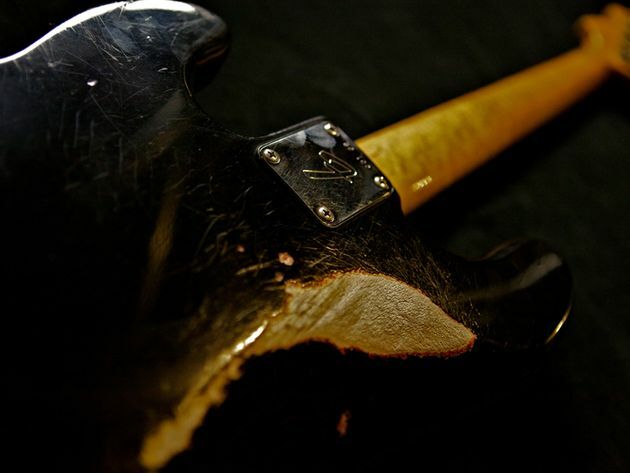 At some point in the early 70’s, the rosewood-fretboard Precision had received an all-maple replacement neck, but for the recording sessions on The Wall in 1978, David Gilmour had Phil Taylor write to Charvel, asking for a custom made heavily flamed maple neck (featuring a Fender logo) to replace the rosewood one on his Strat, the letter itself clearly also specifies a number of other necks, including a new Charvel birdseye neck for a Precision bass. So the (originally) rosewood necked bass received it’s third neck, a Charvel maple neck with a 50’s style Fender logo. It also received a black pickguard, lost it’s bridge and pickup covers and became Roger’s main bass from the 1979 rehearsals to the present day, first seen in this condition on the Wall shows in 1980/81. 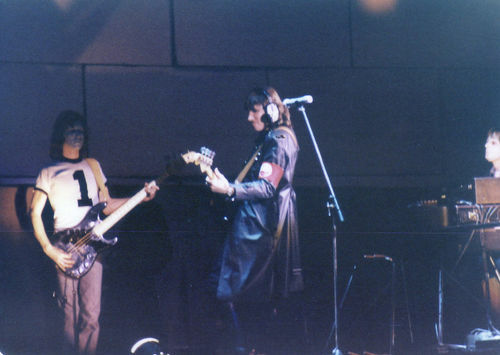 On this tour, Andy Bown can be seen playing a second bass (likely the same as Snowy played on the previous tour as it seems to be missing the headstock ‘dot’). Roger and Andy Bown share bass duties on The Wall tour, 1980/81. 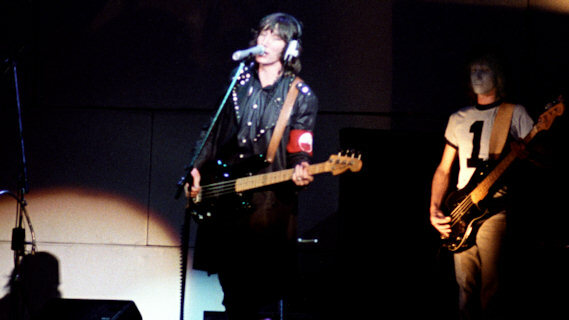 Following his split from the remaining members of Pink Floyd in the mid 80’s, Roger took only the Charvel necked bass with him (this one can be spotted because the “Fender” logo copy is strangely sized and positioned), and so he had the Fender Custom Shop make him two copies, which he has used as backups since. 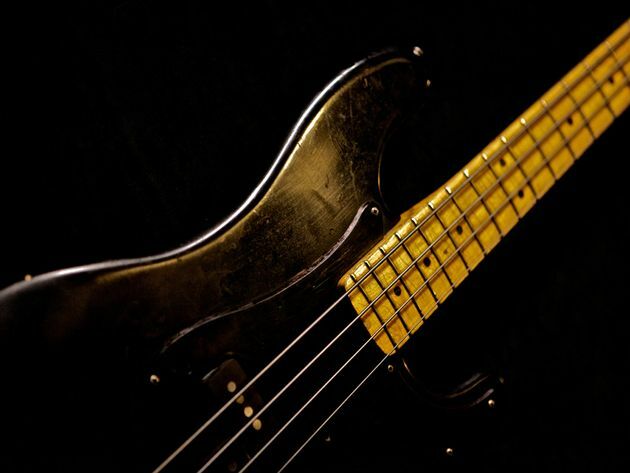 In 2010, the specs of these two copies were also used as the basis of the Fender Roger Waters signature Precision bass, although this model features significant differences to Rogers own (A properly proportioned Fender headstock logo, a single ply black pickguard and black hardware). The ‘Wall’ bass is still Roger’s main instrument, and he continues to use it on every show. Recently, photographer Lisa Johnson featured the instrument in her fantastic book ‘108 Rock Star Guitars in Pictures’, She notes that the pickguard is a three ply black/white/black, but Roger recolours the white pinstripe with marker before every show to make it appear all-black. Some very nice and detailed photos show that the pickguard still retains the holes from the pickup cover and the extra screw hole in the middle of the pickguard which some P-basses of the era featured. (as well as showing Rogers marker work quite clearly). And they do indeed seem to be a perfect match visually. Perhaps there has been some confusion between the original pickups and the Duncans which are in the Fender signature version. If the above quote is genuine, it is a goldmine of information. The detail shots of the guitar in Johnson’s book also reveal some nice features, such as a maple-cap neck (no skunkstripe), an F-stamped neckplate and a heavily worn ‘tummy-cut’. This bass remains Roger’s primary live bass as of the “Us and Them” tour, 2017/18. Interestingly enough, anecdotal evidence and footage of this tour seems to indicate that he plays it for all his bass parts in the show, with the exception of Pigs (three different ones), on which he plays one of the custom shop copies. Perhaps this is because of the “lead” parts requiring better intonation? As an interesting footnote, the ‘dot’ headstock bass remains in David Gilmour’s possession, and was used by Guy Pratt on Coming Back to Life and Take it Back on the Division Bell album, as well as by David on tracks for The Endless River.